I am the first to admit that I'm pretty lucky when it comes to my natural nails. 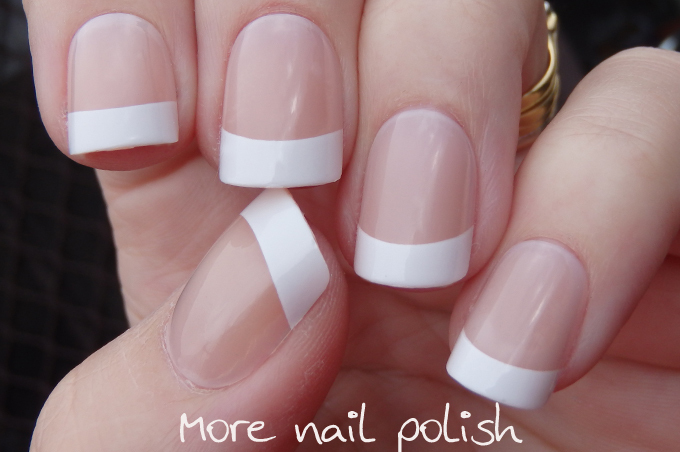 They are strong and don't break very often and they have a decent nail bed length. As such I'm not the sort of person that would really wear false nails. In the past I have tried a few, only because it was an effect that I wasn't able to create with nail polish (such as these metallic blue and gold nails). When the team at Nailene asked me to review some of their false nails, I wasn't sure about it. I certainly didn't want to use nail glue on my nails to stick them on. Then they explained that I could use some of their Ultra Adhesive Tabs to secure the nails and that they wouldn't damage my natural nails. The first step was to select a nail that fit each finger perfectly. I did find my middle finger was the hardest one to fit. I felt the one I chose was a bit to wide, but then next size down seemed too narrow. I used tweezers to peel one of the sticky tabs off at a time and apply the nail. One side is stuck to the sheet and the other side has a plastic film on it. 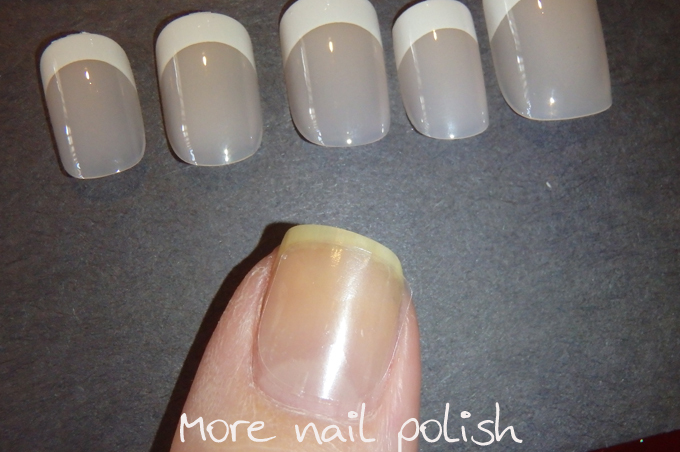 Once it's stuck on your nail, you can smooth it out using your finger on top of the plastic film. You then peel off the film and push down the nail. First of all, I have to say that every time I looked at my hands, they looked alien to me. It was like someone else's fingers were on my hands. But they were alien in a nice way. The colour of the nail was so clean a pink (no signs of yellow staining on these babies). 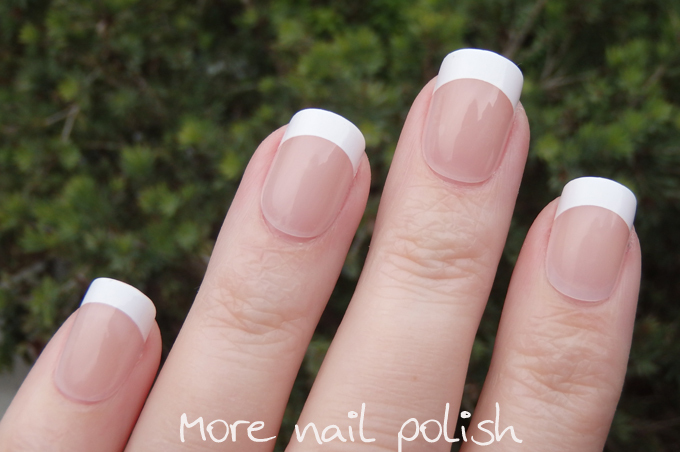 The french tip was also so perfect and sharp, something that I've always struggled to make look this good. The other huge different that I had with these nails compared to the metallic gold and blue ones I've tried in the past is that these are very flexible, just like the packaging says. This meant that I completely forgot that I was wearing false nails for the full 24 hours that I wore these. They really were very, very comfortable. The metallic gold and blue one always created a feeling of pressure on my nails, even though they were only attached with adhesive tabs too. 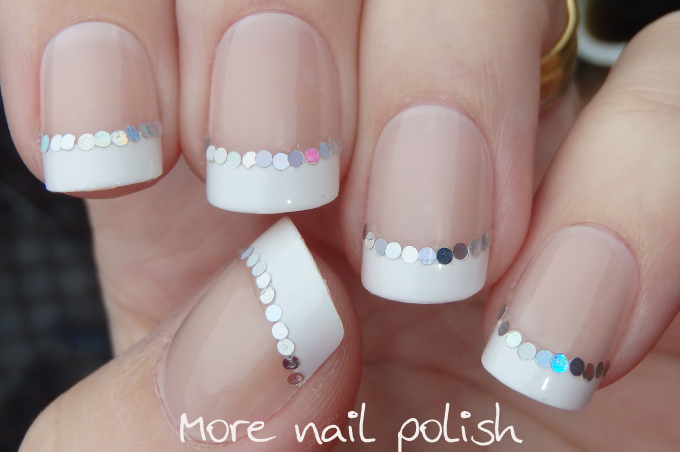 It must be to do with the flexible nature of these nails. 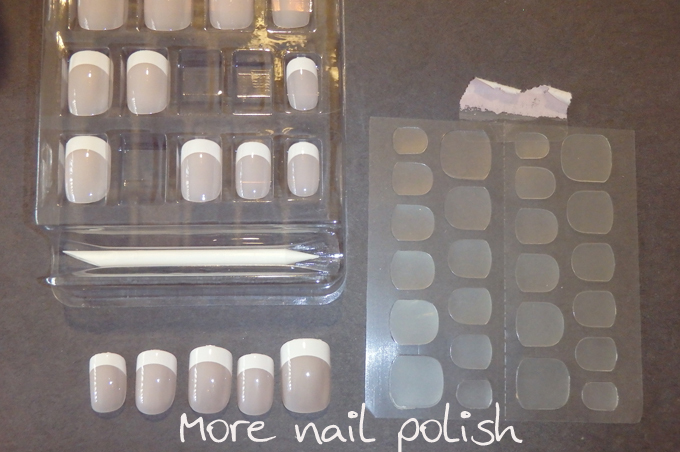 I never felt like the adhesive tabs were moving either, making the nail slide around, in fact I would go so far as to say these were the most perfect false nails I've ever tried. Ok, are you ready to get freaked out by looking at my nails that aren't really my nails? The day I put these on, the hubby and I went out to the movies for a bit of a date night. 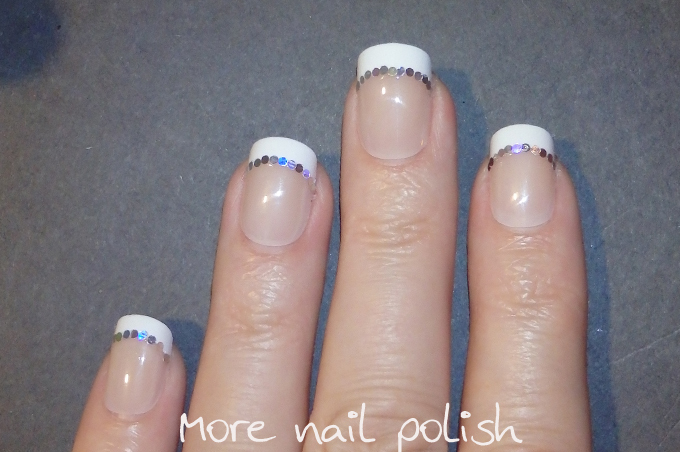 So I decided to sparkle them up by adding some glitter placement using round silver holographic glitters along the french line. All the sparkles didn't stay on all night, because I only stuck them down with a line of top coat and didn't top coat the whole nail. Overall, would I purchase these myself? Definitely. I think having a pack of comfortable false nails on hand is good insurance for if you every have a catastrophic nail break. 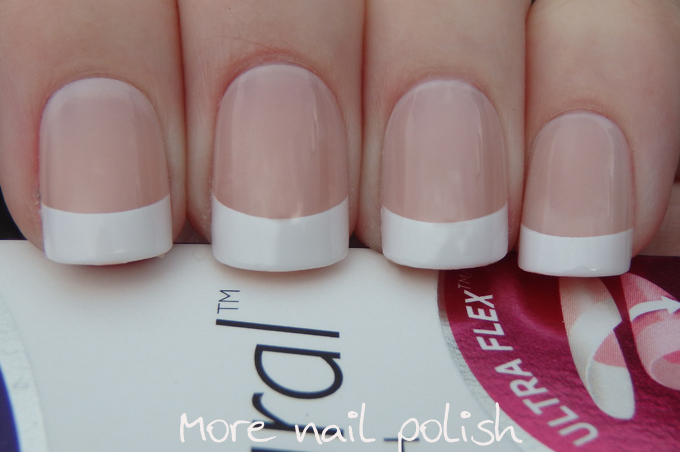 You can slap on a falsie, file it so it matches your other nails and then paint it just like all your other nails and no one will notice the difference. 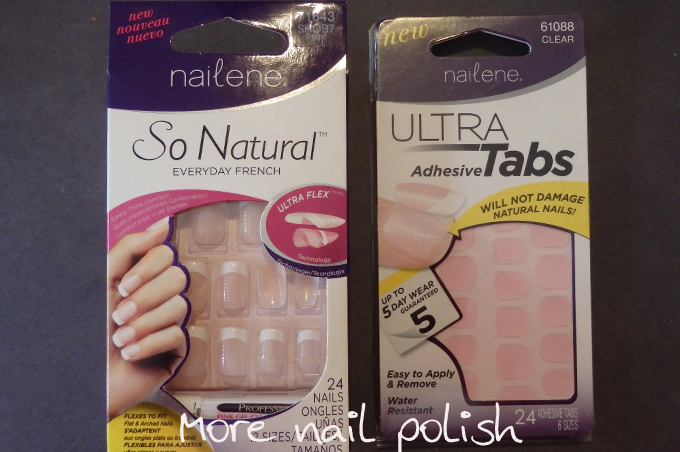 A set of these So Natural Everyday French nails and a pack of the Ultra Adhesive tabs forms part of the amazing prize pack being offered by Nailene Australia. Australian residents, enter below for your chance to win. Wow I'm actually quite impressed with these. Very perfect looking and hard to tell they're fake. I like how you decorated the nails.